​​Combines the power of a computer with the ability to scan any symbology on an employee badge (bar code, magnetic strip, prox chip). The hand-held device is also capable of scanning a driver’s license for individuals who are non-badged, and pull off the necessary identifiers from that license to capture the specific employee event, without having to resort back to a paper form. 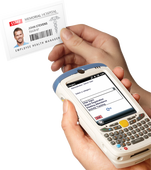 ​Quickly capture data from badges, vials, syringes, and medications without any manual entry. Most popular uses include: ​Vaccination Campaigns, TB Testing, Attendance Tracking, Biometric Assessments and more. ​Easy to view in various lighting conditions. Collect signatures on the device. Expandable memory solutions to securely store your data until downloaded into EMR/HR/Employee Health software systems. ​QYK Scanners can be configured to work with most EMR/HR/Employee Health software systems. Send questionnaires BEFORE patient's office visit. All of your forms available 24/7. 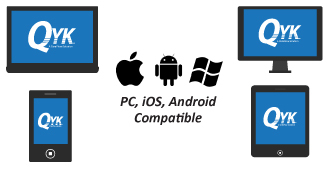 Works with smart phones, tablets, laptop and ​desktop computers. ​​QYK Web runs on your own internal network. The site is password protected, and only accessible to designated administrators of your choosing. ​​Use your own devices (laptops, tablets, mobile phones) to capture employee health data for Vaccination Campaigns, TB Testing, Attendance Tracking, Biometric Assessments and more. Compatible with multiple badge symbologies: bar code, magnetic strip, and prox chip. ​Accessible from multiple locations with concurrent connections running at the same time. Ideal for hospital systems with multiple locations, including clinics. ​QYK Web can be configured to work with most EMR/HR/Employee Health software systems. ​Simultaneously transfer data from multiple QYK Scanners without docking. ​QYK protects PHI with passwords and encryption to keep data safe and in compliance with HIPAA and the HITECH Act. ​Collected data is stored within the hospital's network and ready for automatic import to most software solutions. ​QYK Scanners with wireless capabilities can be configured to integrate with most EMR/HR/Employee Health software systems.